The K-1 Platinum enables users to experience a relatively simple and convenient method of exercise. Maximum benefits are achieved with just 10 minutes of use per day. 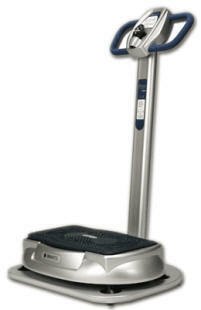 The K-1 Whole Body Vibration Exercise Machine is designed for Fitness, Health, and Therapy. K-1 Vibration exercise is an excellent alternative to traditional exercise with benefits including increased muscle mass, improved circulation, flexibility, range of motion, balance, and mobility. With whole body vibration, hundreds of muscle contractions per minute create an invigorating workout designed to increase lean muscle mass and firm muscles to create an overall effect of a more toned, firm, and healthy body. Using the K-1 Whole Body Vibration Exercise to tone muscles and increase lymphatic drainage may help fight off cellulite while the improved circulation induced during vibration therapy may be able to tighten the skin. The imbalance caused by the gentle rocking vibration of the TOS is designed to increase flexibility, range of motion, balance, and mobility. Increase bone density with whole body vibration exercise as it was originally designed to do by one of the world’s leading space programs. There have been worldwide scientific studies of whole body vibration systems that indicate high success rates in treating osteoporosis. The potential for an increase in bone mineral density while using the K-1 Platinum is a viable solution to prevent further bone loss and to help combat osteoporosis. Neuromuscular reeducation is possible in applicable situations, such as with MS, CP, or after a stroke. Seeking advice from a physician familiar with whole body vibration exercise therapy is recommended. Elevated levels of HGH have been indicated with use of vibration therapy. These elevated levels have been shown to help the body heal and repair after injury or surgery. The K-1 may also help in treating athletic injuries, as well as providing a sports massage effect, due to the hormone secretion ratio that is involved with growth and recovery. Maximum results are achieved with just 10 minutes of vibration exercise at least three times per week. Using the K-1 Whole Body Vibration Exercise Machine for 10 minutes is considered to be equivalent to 60 minutes of resistance training, or working out at the gym. Over 80 different exercises can be produced by making minor adjustments to body positioning making the K-1 one of the easiest and most convenient ways to get in shape and maintain good health. The K-1 Vibration system is available at Holistic Care Approach in Grand Rapids, Michigan. Click here to view pricing. A remote control is included with the K-1 Platinum for ease of use personally or with trainer assistance. There are three auto settings for beginning, intermediate and advanced users along with ten manual settings for more specific intensity adjustment. Hand straps are included for additional upper body workout options. The K-1 Whole Body Vibration Exercise Machine is commercially rated and can be used for extended periods of time in clinical or health club type settings. The K-1 Platinum Whole Body Vibration Machine provides isometric anaerobic exercise through the use of whole body vibration. The K-1 improves upon this vibration by utilizing the Triangular Oscillating System (T.O.S.). The Triangular Oscillating System provides a gentle rocking motion rather than just up and down movement as a way of reducing the impact on joints and ligaments. There is a substantial difference between T.O.S. and “piston” or “tri-planar” vibration used by many other vibration machines that can cause stress to those areas. The T.O.S. utilized by the K-1 generates systematic involuntary muscle contraction with less G force than the piston driven tri-planar systems, designed to cause less stress on the joints and ligaments. This pleasant rocking motion causes the brain to tell the muscles of your body to actively contract to maintain equilibrium, thus creating a therapeutic and muscle toning workout. This unique Triangular Oscillating System provides all the benefits of whole body vibration with minimal risk of damage to the body, making it a safe and efficient source of exercise, wellness, and therapy. The concept of Whole Body Vibration was developed for the Russian Cosmonauts in an effort to combat muscle atrophy, bone density loss, and blood clotting during extended periods of exposure to zero gravity. Decades of research and endorsements indicate that this innovative machine produces effective results. The motion of the vibration platform causes the brain to tell the muscles to actively contract to maintain equilibrium. Scientists first discovered the positive effects that vibration technology had on strengthening muscles, increasing flexibility, and improving bone density, further research indicated that vibration therapy may provide many other benefits in a variety of areas.